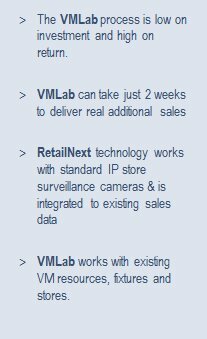 VMLab is the most certain way to ensure that all investments in the retail experience achieve their maximum return and generate real increases in sales performance. the breakthrough approach and technology to maximize store investment return and generate sales increases! Call us for a free demonstration. Get a quote for your first VMLab store, and see sales benefits in 2 weeks!